The Lytle Creek League of Conservators announced today the completion of a 20-station self-guided audio nature tour. Ten station markers are now located along the Luther Warren Peace Path, with the remainder running along the 4-C Bicentennial Trail which then connects to the Lytle Creek Nature Preserve Trail. Inspired by Conservator, John Deignan and City of Wilmington Parks and Recreation Director Lori Williams, the project is primarily geared towards individuals who have relatively little background in natural history. A view of one of the stations from the Luther Warren Peace Path. 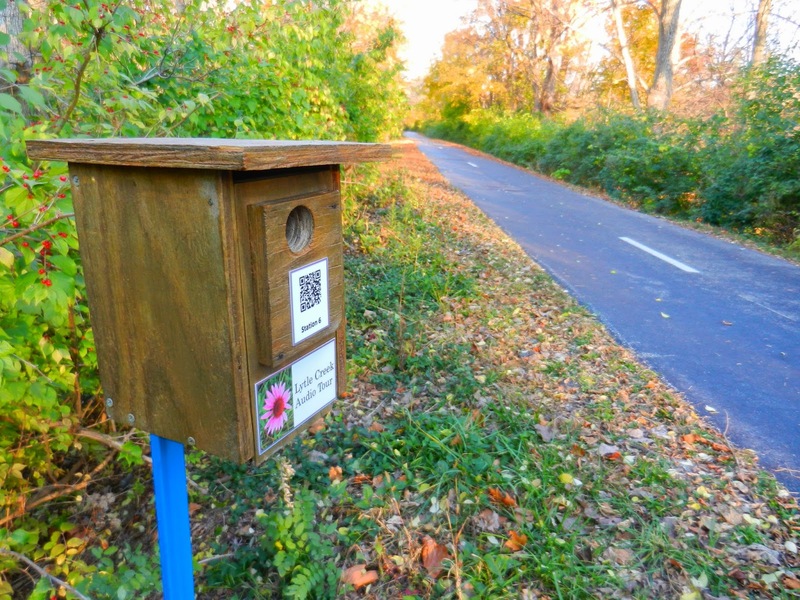 Each numbered station is identified by the presence of either a birdhouse on a blue pole or a plaque. There are multiple ways to access the content. Each station’s three to five-minute audio file has a QR code that can be accessed using smart-phone technology. Additionally, audio files are available on CD-DVD format, for those who wish to download the content to mp3 players. Links to the files and tour maps can be found below. The Parks Office will also have a few mp3 players that can be signed out. The first leg of the tour begins at Nelson Avenue, across from the city wastewater plant and runs to Mulberry Street. The second leg of the tour begins at South East Community Park, near Paris Avenue and continues along the bike path. Look for a kiosk on the right where the route continues into the Nature Preserve. The Lytle Creek League of Conservators is a Clinton County citizen group dedicated to conserving Lytle Creek for education and recreational purposes. Public nature-based events as well as “No Child Left Indoors” programs are provided courtesy of this group. For more information on joining the League of Conservators, please contact Lori Williams at the Park Office at (937) 382-4781.